After Cleaning out my coupon stash and trying to reorganize, I found some coupons I had multiples of that I don’t think I will use and want to share them with YOU! 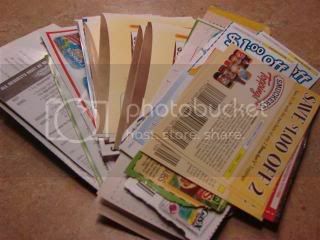 These are all coupons from magazine, news paper inserts, in home mailer, or other non-printable sources! :) There is a wide variety of food, health & beauty, medicines, baby items, etc. Hopefully this will help some newbies couponers or oldies out!!! Easy Entry: To enter just leave a comment on this blog entry. You can earn (1) extra entry by blogging about this giveaway! (Leave a separate comment with the blog link.) It is very important that you leave a separate comment to be entered twice! Ends 9/14 around 11pm PST. (As long as you can still comment you can enter!) Winner will be announced on the 9/15 and I will contact you to get your mailing address. Only US residents for this giveaway! That is really nice to do give-a-ways. Thanks for the chance. Great site. Please enter me in your contest. I am a beginner but with all of these blogs I am becoming a pro very quickly. Thanks a lot. I never leave home w/out coupons!! I am addicted to couponing! I am a newbie to coupons – thanks for this chance to build my stash! Mom of 3 Peass last blog post..What are Connectagons? Any of these I don’t use, I would pass on friends and family to maximize the benfit of winning! Great giveaway, I could use this! Your giveaway will be part of my Super Freebie Friday post this week. …my second entry. Thank you. Wow! $100 worth of coupons/rebates. Hope I’m blessed enough to win. Would definitely benefit from the stash. Thank you. You have some really nice coupons in the bundle! Wow! Thank you for thinking of others I would love to win!! Thanks for doing so much of the work for us. I love coming here to read about all the great deals each week!! Thanks for sharing the wealth! Great Give-away!! Sign me up! What a great giveaway for families trying to stretch their grocery budget! yay for coupons! I just started couponing a few weeks ago – the Luvs coupons would be especially helpful! The more the merrier as far as coupons go – I’d love to have them! Thanks for sharing and for the opportunity to win! I am the manager of a senior citizens nutrition center. If I win I will use the coupons for the center. I have just started using coupons and really see the difference they have made in the amount I can save. I’ve been thinking about starting the whole coupon thing, but we don’t get the paper normally, so I only have a few. It would be great to get a jump-start — we use many of the products in these coupons, so it would be a great savings for us. Thanks for the generosity! We can always use coupons. Thank you so much for the chance? Please enter me in your coupon giveaway.Thanks! Oh wow, lots of goodie coupons! I am a newbie at this and I could use most of the coupons. What I cannot use I would with family members who could use them. I am going to post about this in my blog (you’ll see another entry for that). Thanks for entering me! Thanks for a chance to help out my daughter’s young family. Wow! These are some great coupons. Thanks for the giveaway. I love to save money with coupons. It’s so much fun. Thanks. please enter my name. thanks for doing this! Fantastic idea! Great coupons! I am so glad I started coupon-ing with such nice people! I’d like to enter too! Thanks. Awesome idea! How creative. I’d love to win. I share all my coupons with my best friend who is mom of 4 (triplets + 1) and the rest we give to our local Elks Lodge and they send them overseas to military families. Heathers last blog post..Coupon Giveaway! What a great idea! I’d love to win!!! Can I send the ones I don’t need to the runner up? I want in! I’m a coupon addict. I will be back to leave a link to my blog about this! Thanks for sharing your extra coupons! Great giveaway! That’s fantastic–thank you so much! Thanks for the opportunity! You are giving away some great coupons! Thanks! I visit your site weekly and love the great ideas. I cn’t use them all, but I can share the rest with my Financial Group and friends. seesawstars last blog post..Giveaways Galore! Please enter me in your giveaway…! There are some coupons in there that I would -love- to have! I blogged about it in two places and I passed it along in two of my e-mail groups. You might get a lot of hits. Wow…what a lot of great coupons! I love collecting coupons. I love trying to save money and share these tips with others. I’ll be sure to blog about it too. I love coupons and saving money! Thats so nice of you to have a giveaway, thanks for entering me. Oooh, what an awesome giveaway! I love Kashi. I hope I win! I would LOVE this especially for the diaper coupons! I have 3 baby showers on the way!